Protesters demonstrate in Tehran on June 25. 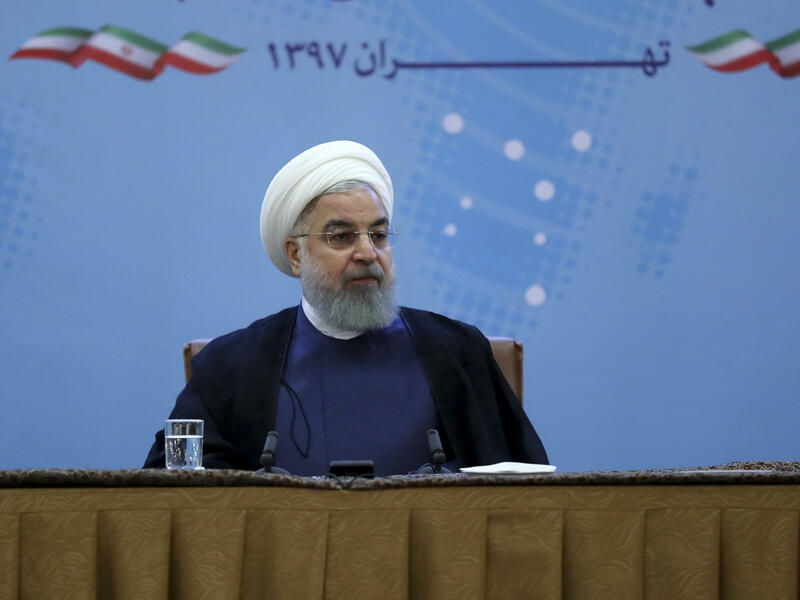 In this photo released by official website of the office of the Iranian Presidency, President Hassan Rouhani attends a meeting with a group of foreign ministry officials in Tehran on Sunday. When President Trump warned Iran over Twitter on Sunday night about severe consequences for any threats toward the United States, it did not just come out of the blue. Speaking to reporters on Monday about the president's all-caps threat, White House press secretary Sarah Sanders said that Trump's language has been "pretty strong" toward Iran all along. But the Trump administration has been ramping up rhetoric about what it calls Iran's "malign" behavior in the region. Administration officials also seem to be trying to encourage Iranians to rise up against their government. 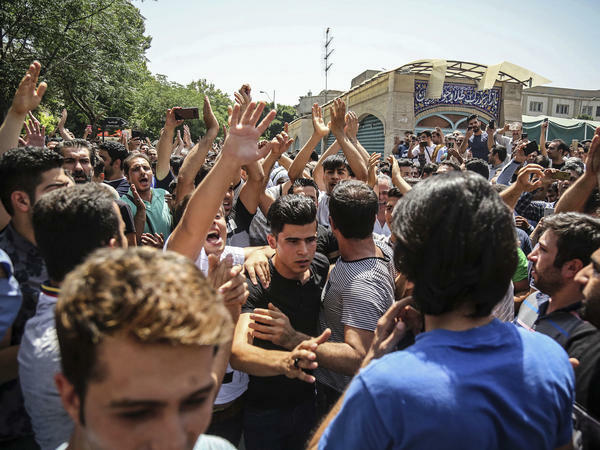 Protests have mounted in recent weeks in Iran, as the country struggles with an economic crisis that has grown more severe since President Trump's decision in May to pull the U.S. out of the Iran nuclear deal and reimpose sanctions on the country. Secretary of State Mike Pompeo has been tweeting about the protests — sometimes exaggerating them. He's trying to show Iranians that the Trump administration backs those opposing the Iranian leadership. In a speech to members of the Iranian-American community on Sunday in Simi Valley, Calif., Pompeo said the U.S. Broadcasting Board of Governors, or BBG, is trying to help residents in Iran get around Internet censorship. "The BBG is also launching a new 24/7 Farsi-language TV channel," he said. "It will span not only television, but radio, digital and social media format, so that the ordinary Iranians inside of Iran and around the globe can know that America stands with them." When he was asked during that speech whether it was realistic to think that the Iranian people will be able to take control of the country from what Pompeo described as a "mafia"-like regime, the secretary of state had an easy answer: "Of course." But retired U.S. ambassador John Limbert, a former deputy assistant secretary of state for Iran, has his doubts. "I keep wondering who is feeding him this information," Limbert said of Pompeo's remarks. "It's clear from his speech that he understands nothing about the internal dynamics of the country." Limbert was among those held captive at the U.S. Embassy in Tehran during the 1979-1981 Iran hostage crisis, and more recently advised the Obama administration. He worries about the influence of an Iranian exile group that advocates the overthrow of the Iranian government and was included on the U.S. terrorist list until 2012. The group is called the Mujahedeen-e-Khalq, which means People's Mujahedeen Organization of Iran, also known by its initials MEK. "Their message is that the place is on the verge of overthrowing the Islamic Republic, which has been a claim for the last 40 years and that they, in particular, are the logical democratic, pluralistic replacement. Now, if you believe that, I have some Florida real estate I could sell you," he said. Trump's national security adviser John Bolton is a supporter of the MEK. And U.S. Ambassador to the United Nations Nikki Haley retweeted a video posted last week on an official MEK account. The State Department, though, says no known member of the Iranian exile group was invited to Pompeo's speech. His message was mostly about supporting Iranians inside the country who have been protesting. Trump's late-night tweet addressed Iranian President Hassan Rouhani and went into a sharply worded warning in all capital letters of a massive yet unspecified American response if Iran ever threatened the United States again. Iran's Foreign Minister Javad Zarif shrugged it off in his own tweet Monday afternoon: "COLOR US UNIMPRESSED: The world heard even harsher bluster a few months ago. And Iranians have heard them —albeit more civilized ones—for 40 yrs. We've been around for millennia & seen fall of empires, incl our own, which lasted more than the life of some countries. BE CAUTIOUS!" A senior commander of Iran's Revolutionary Guard was quoted in Iranian media saying "Iran will resist pressure from the enemies" and that Trump's threats against the country amounted to "psychological warfare," Reuters reported. "America wants nothing less than [to] destroy Iran" but "Trump cannot do a damn thing against Iran," the commander added. Tensions escalated between the Trump administration and Iran, even as Iranians put pressure on their government. Analysts say activists inside Iran see a connection between the international tensions and the worsening economics. "I see a new generation of Iranians on the scene who are impatient and especially very troubled with the way they pay the price for their government's foreign and domestic policy," said Hadi Ghaemi, who runs the Center for Human Rights in Iran, a New York City-based nonprofit advocacy group. But Ghaemi, speaking via Skype, said the Trump administration's other policies hurt average Iranians. Those include a travel ban and the resumption of economic sanctions, including a new round set to target Iran's automotive industry next month. "We do find it quite odd that the administration is so passionate and loud about human rights in Iran but really not in other [countries]," he said. Another Iran watcher, Ariane Tabatabai of Georgetown University, also fears the rhetoric from Washington could backfire. "We have a bit of a Goldilocks problem when it comes to Iran on a number of levels, and this is one of them," she said. In her view, the Obama administration was so determined to reach a nuclear deal with Iran that it ended up ignoring protesters inside the country. "President Trump, on the other hand, I think is too forceful," she said. "I think that he believes because his hard line on North Korea paid off that it is also going to pay off with Iran. And I just don't think that's the case."